So what will your family be doing on Thanksgiving? 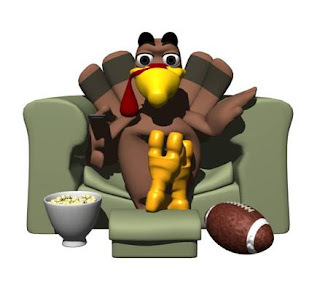 For most families Thanksgiving means lots and lots of football. Some kids love football and others have no interest in it. A great holiday gathering can turn very bad, very fast if kids get bored. A great holiday with family is when you keep kids occupied so there are less chances for them to get bored and get into trouble. I would like to share with you some ideas of how to keep kids busy this Thanksgiving. This first game is a Thanksgiving / Football version of playing pin the tail on the donkey. Kids can have a blast and stay occupied for quite a while with this one. Even the smallest and least athletic child can score in this game. The kids can take turns being blindfolded and sticking the football up. 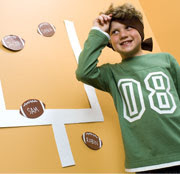 Remember to turn the kids around a few times after they are blindfolded so they are not sure where the goal post is. This is what makes it harder to score and the game even funnier. Eggs are not just for Easter. Turkeys lay eggs so why not have an egg game for Thanksgiving? In this game one person leaves the room while a hard boiled egg is hidden. When the person comes back in the room they have to find the egg. To make it more fun the people in the room will gobble when the person gets closer to the egg. The gobbles get louder as the person gets closer. What could be more fun than a room full of friends and family gobbling? Since I am stuck in the kitchen all day, I have very little idea what the kids do. I know they talk and play videos. The older ones (18 years old +)tend to stick around the kitchen and living room talking with the adults. I may be able to hear the football game (I hope so). Have a great Thanksgiving!